Posted by សុភ័ក្ត្រ in បោះ​ឆ្នោត​២០១៨, ប្រវត្តិសាស្ត្រ. Posted by សុភ័ក្ត្រ in នយោបាយ, បោះ​ឆ្នោត​២០១៨, ប្រវត្តិសាស្ត្រ, English. Posted by សុភ័ក្ត្រ in នយោបាយ, បោះ​ឆ្នោត​២០១៨, English. Australia has expressed serious concerns to the Cambodian government about the country’s national election. Foreign Minister Julie Bishop is worried political parties, civil society groups and the media were blocked from operating freely during the poll, reversing more than 25 years of progress towards democracy in Cambodia. 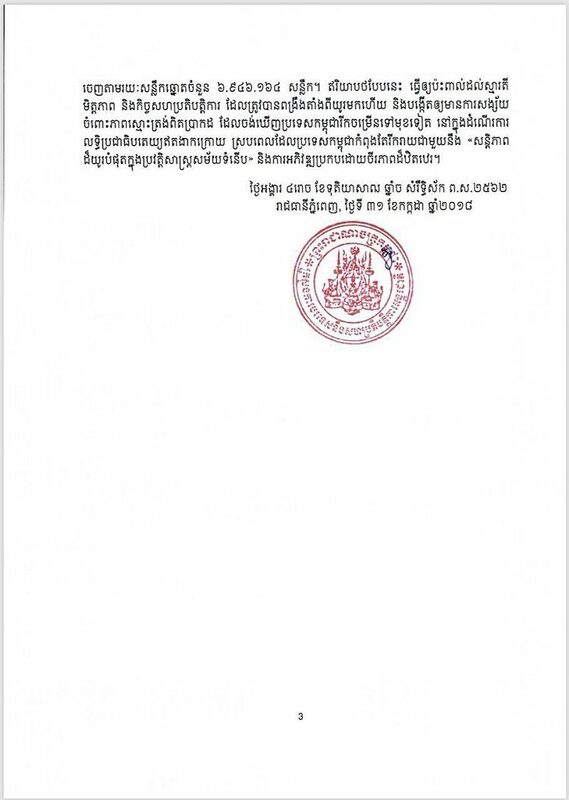 The election saw the dissolution of the main opposition Cambodia National Rescue Party, the detention of its leader Kem Sokha, and the banning of its parliamentarians and officials from politics for five years. Cambodian prime minister Hun Sen also threatened to unleash civil war if his bid to extend his 33-year rule was rejected. 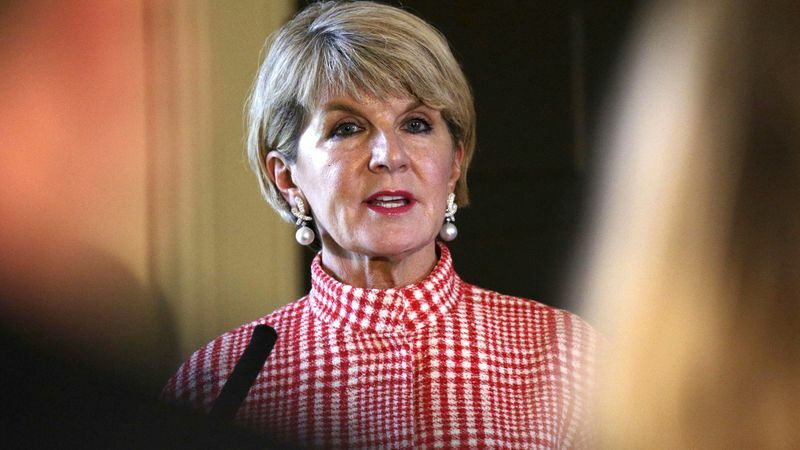 “Australia is disappointed that Cambodian people have been unable to freely choose their representatives,” Ms Bishop said in a statement on Monday. Greens leader Richard Di Natale demanded the Turnbull government refuse to recognise the “anti-democratic and bogus” election result. Senator Di Natale said it was disgraceful the government just months ago celebrated Australia’s strengthened ties with Cambodia, believing it was influenced by a “dodgy” refugee deal with the Southeast Asian nation. 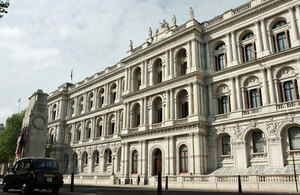 “It’s time for the foreign minister to do more than just meekly express concerns. We must refuse to recognise the result, and call for the release of all political prisoners,” he said. 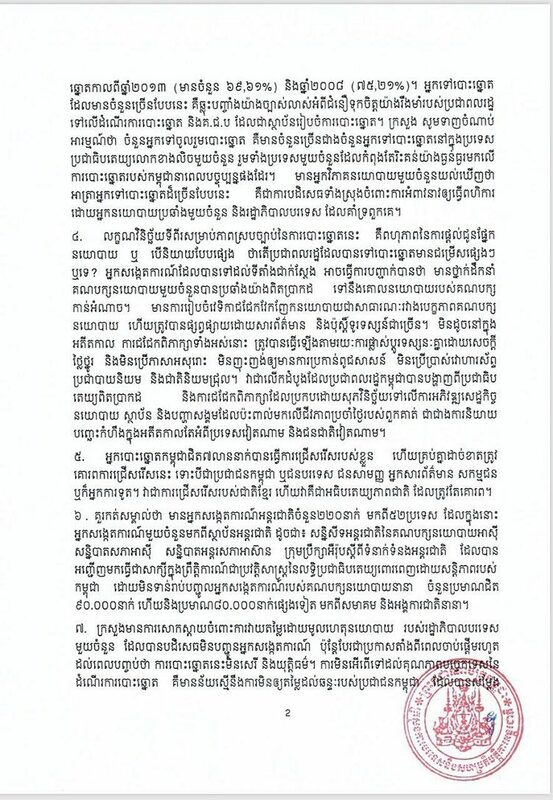 The minor party believes Australia must follow the United States and other countries which have implemented targeted trade and travel sanctions against Cambodia. The Greens also want the “shameful” refugee deal abandoned. Labor has backed the government’s decision not to send Australian election monitors to Cambodia, believing they would have given legitimacy to the “sham” poll. Opposition frontbencher Mark Dreyfus called on Cambodia to restore a viable opposition and free press, and to immediately release Kem Sohka from custody. “We urge the Cambodian government to allow its citizens to exercise their democratic rights,” Mr Dreyfus said. Posted by សុភ័ក្ត្រ in បោះ​ឆ្នោត​២០១៨, ប្រវត្តិសាស្ត្រ, English, Français. Posted by សុភ័ក្ត្រ in បោះ​ឆ្នោត​២០១៨, ប្រវត្តិសាស្ត្រ, English. “Today, incumbent prime minister Hun Sen and his Cambodian People’s Party retained power after the country’s general elections. The election campaign was widely recognized to have been marred by voter intimidation and manipulation of the polls. 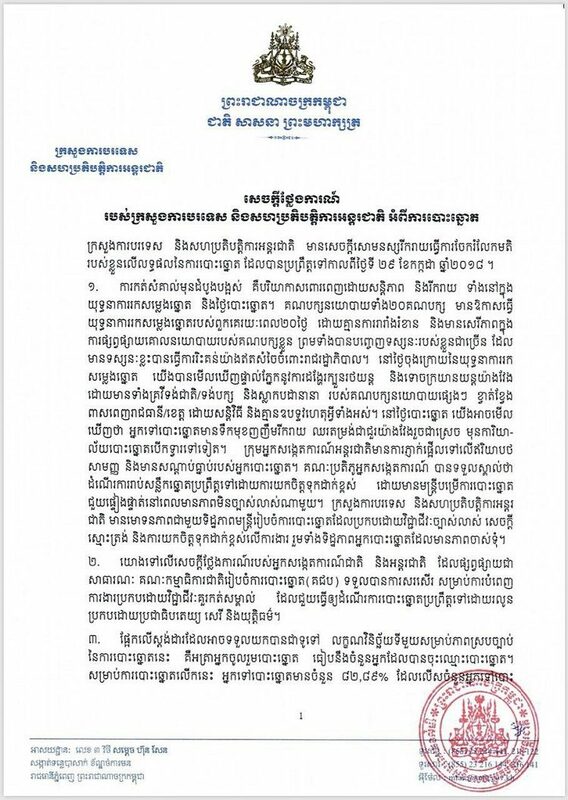 The use of the judiciary to harass, intimidate and eliminate the opposition—including the leader of the Cambodia National Rescue Party, Kem Sokha, who remains imprisoned—and to repress civil society and the press is not a mark of free, fair and just elections. “Canada is a long-time friend of the people of Cambodia and strongly supports their right to freely choose their leaders. We continue to call on the government to allow basic civil rights for the people of Cambodia, reinstate freedom of expression and political participation and release opposition leader Kem Sokha, who has been held in jail for almost 11 months without bail.